Calendars can be very useful in your course for displaying assignment due dates, online quiz availability, synchronous meeting session times, or any other event you would like to draw student's attention to. Several new features have been added to the calendar in summer 2018 including a modernization of the look and feel. To add a calendar to your eClass course, first ensure that you are in editing mode by clicking on Turn editing on at the top right. Next, from the Add a Block button on the bottom of the left nav drawer, select Calendar. 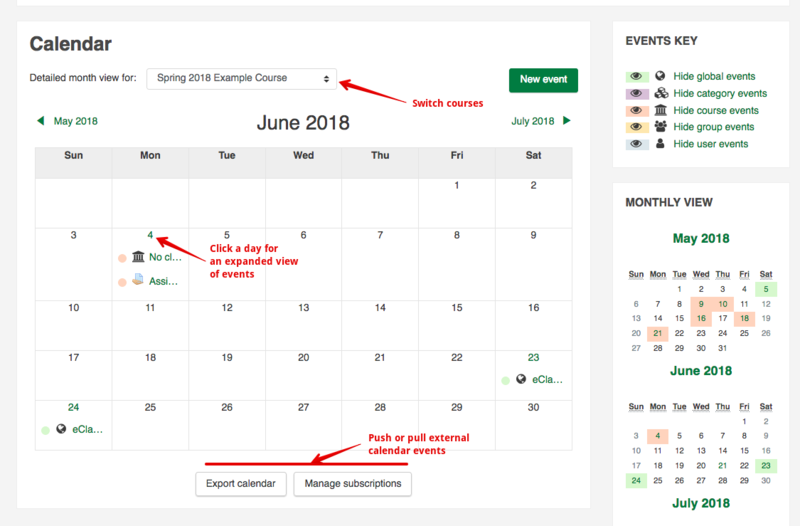 Students are able to add a calendar block to their dashboard (if it is not already there) and can add 'user' type events that appear only on their own calendars (their personal events will be invisible to instructors). 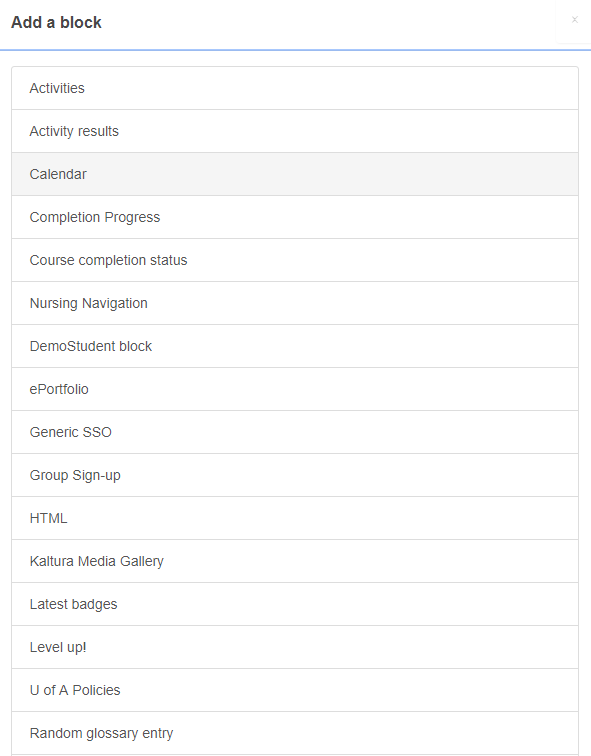 A monthly calendar will appear in a new block, and by default will automatically display all activities in your course that has an associated due date, with hyperlinks to relevant activities. 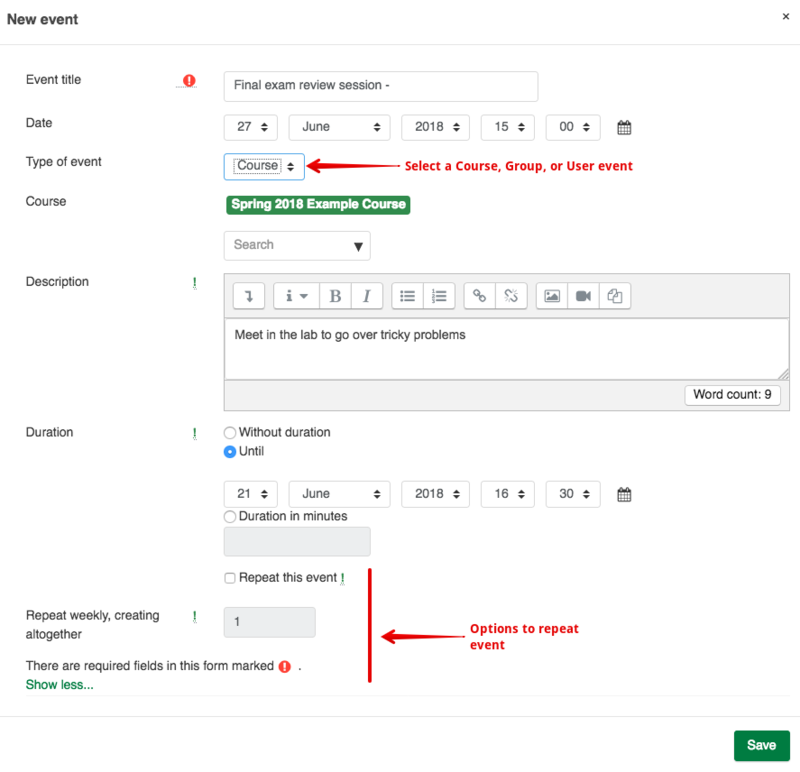 The various types of events are identified by colour and users can filter out particular categories of events with the various Hide ... events links. 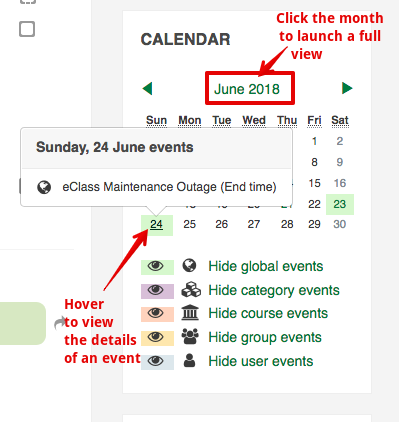 New in 2018, the category event type has been added which allows users with a 'Category manager' role to add calendar events for all the courses that they administer. Contact eClass support for more details on this feature. Users can hover over any of the coloured cells to get a quick view of events on that day. Clicking the Month name at the top of the block will open the calendar in full page view for more detail and to add new events. 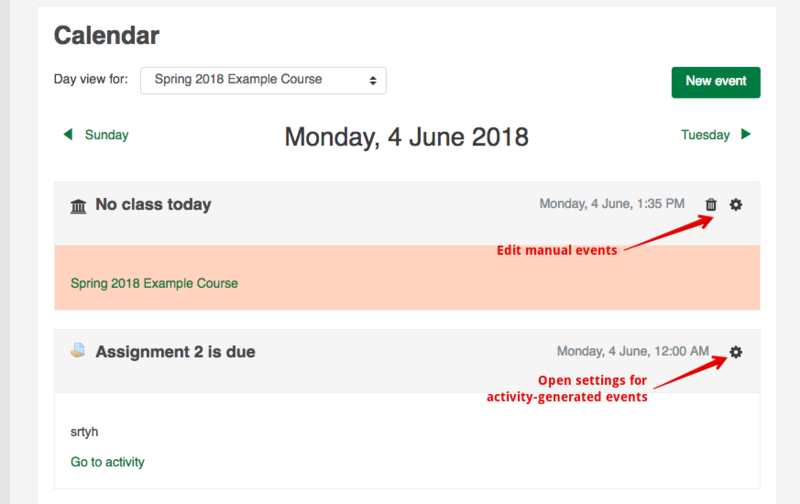 From the full screen month view you can switch to other course calendars, look at a detailed view of particular days, add new events, and export or import external calendar events. The single day view allows you to see full details and edit any manually entered events. Enter the details for your event in the 'New Event' screen. 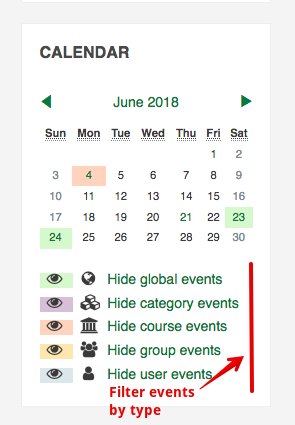 For the 'Type of Event' box, you as the instructor will have three choices: to create a 'Course' event that will be visible to all participants in your course; to create a 'Group' event visible only to members of particular groups; or to create a 'User' event that will make your event visible to only you. New in 2018, if you happen to add a calendar event on the wrong day, you can repair this easily by dragging the event to a different date on the calendar. If the event happens to be associated with an activity, the dates will be updated in the activity settings.